Cate Beauman is back with the eighth installment in her bestselling romantic suspense series, The Bodyguards of L.A. County. Reagan’s Redemption is on sale now through Amazon, Barnes and Noble, iTunes, Kobo, and more! Doctor Reagan Rosner loves her fast-paced life of practicing medicine in New York City’s busiest trauma center. Kind and confident, she’s taking her profession by storm—until a young girl’s accidental death leaves her shaken to her core. With her life a mess and her future uncertain, Reagan accepts a position as Head Physician for The Appalachia Project, an outreach program working with some of America’s poorest citizens. Shane Harper, Ethan Cooke Security’s newest team member, has been assigned a three-month stint deep in the mountains of Eastern Kentucky, and he’s not too happy about it. Guarding a pill safe in the middle of nowhere is boring as hell, but when he gets a look at his new roommate, the gorgeous Doctor Rosner, things start looking up. Shane and Reagan encounter more than a few mishaps as they struggle to gain the trust of a reluctant community. They’re just starting to make headway when a man’s routine checkup exposes troubling secrets the town will do anything to keep hidden—even if that means murder. I’ve wanted to tell Reagan and Shane’s story for quite a while now, but I kept putting it off, knowing where the weeks of research would take me. Reagan Rosner is a doctor, which is great for her but not so much for me as the writer. Unfortunately, I’m a bit of a hypochondriac who is afflicted with White Coat Syndrome. Typically, I stay as far away from anything “medical” as possible, but for Reagan’s Redemption I had to dig deep and conquer a personal demon or two. There were many days where I cringed, watching how-to videos on IV insertions and blood draws and hyperventilated my way through more than one resuscitation tutorial, but I did it, making Reagan’s character all the more stronger for it. After the days of dreadful research, I really knuckled down and got to work. I had so much fun with this story. Reagan is kind and dedicated and Shane extremely funny. This couple complements each other well, which is perfect because they’ll face more than their fair share of trouble in Black Bear Gap, Kentucky. I hope you enjoy Reagan and Shane as much as I enjoyed writing them! “Sounds like you’ve got a plan. Go get ‘em, tiger.” He liked seeing her like this—her eyes bright, her hands punctuating certain words as they spilled from her mouth, caught up in her own enthusiasm. Did you enjoy the excerpt? You can read the first chapter on my website, www.catebeauman.com, or you can finish the whole book here! Here are a few of the songs that I had on “repeat” while I created Reagan and Shane’s story! You can listen to them on my website www.catebeauman.com. Cate currently lives in North Carolina with her husband, their two boys, and St. Bernard’s, Bear and Jack. She is the author of the best-selling romantic suspense series, The Bodyguards of L.A. County. Before her career as an author, Cate worked in special education for 12 years. “I’m a pretty lucky girl; one day I woke up and my entire life changed. I saw the light, so to speak, and decided I was going to be a writer. Now, five years later, I’m working on my ninth novel, Answers For Julie, which I plan to release during the summer of 2015. I’m remain so very grateful for the support and success that I have had. Thank you!” - Cate. 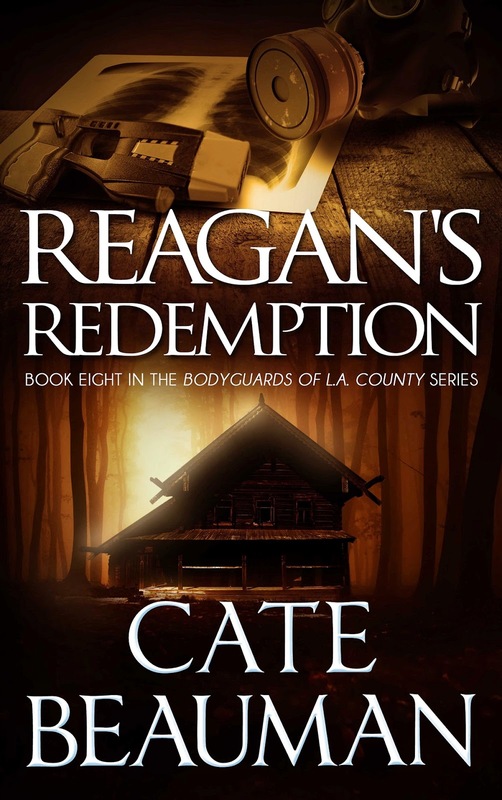 Enter to win one of three autographed copies of Reagan’s Redemption in paperback! I'm really enjoying the series and looking forward to reading this book! Hi Jonetta! Great to "see" you again! I hope you are enjoying a productive start to your week! Hi Irma! Thank you very much for the kind words! You are welcome to join me on my Facebook Fan Page if you like. All kinds of conversation and monthly giveaways to get involved with. I appreciate that you took the time to comment!